That's a real pretty conky you got there. Mind sharing the code? Admin edit: Link removed because the user (most likely unknowingly) shared personal data. Your eyes are obviously better than mine. I have to strain to see that. right click to the image, "copy image location", then "Paste and go" to a new tab or browser window. You'll see a little better. Eh no, this time i'm not going to use artwiz fonts "cure, lime or anorexia" on the panel, yeah i like how they look but it's time to use a bit bigger font. ^ DUH! I should have thought of that. Yea, looks nice. And I can see it better. have a one-line conky on the desktop for over one year now. 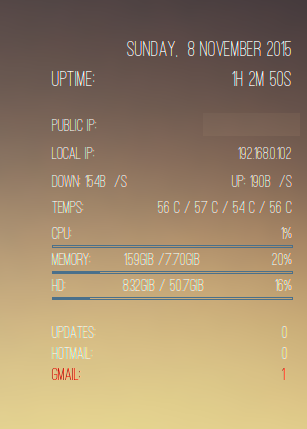 mostly solo, sometimes in combination with time/date or audio-info conky's. ^ I'm missing one, I only see 8 conkys. I showed these over at CrunchBang - so the screenies are a bit old but I still run the same conkys. Desktop 1 - my main work area. Desktop 4 - my wife's playground. Interesting: They have all been 'tweaked' since then, but I still run them all. Yea, I missed that clock. # CrunchBang conky modified and then modified again for BunsenLabs. USB code derived from post #7 of this thread. Hey brontosaurusrex how you doing? Nice! Can I 'borrow' the flame. No more counters resetting on logout/exit. The 5 minute update is a small price to pay. Well thanks to vnstat, she did all the work but I agree with you once i suffered too about what you say.